Freshwater systems make up a small percentage of the earth surface and yet are vital to systems to humans and all other plants and animals. The management of these systems is increasingly complex and with the need to make a finite source stretch across the economic, social and community landscape. 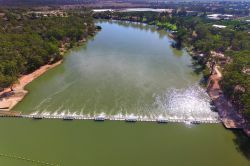 Through the considered evaluation and adaptation of management programs, we will be better placed to protect and enhance the natural assets of the river systems in Australia while supporting the sustainable use of water. To achieve sustainable management we require sound knowledge of ecosystem function and how ecosystems respond to change so that we can protect critical habitats, connections and ecosystems functions. Our researchers address this challenging area by undertaking a range of research projects that assess environmental flows in rivers and wetlands; the effects of salinity; wetland acidification, rehabilitation, microbial, fish and invertebrate ecology. The knowledge generated by these projects is fundamental to the development of ecosystem management strategies.